The Old Man once told me he use to think I was funky and kitschy, but it dawned on him I really just have the taste of an old lady. As time goes by, I realize he hit the nail on the head. This was painfully obvious a couple of days ago when I got a wild (grey) hair and went on a online shopping rager. 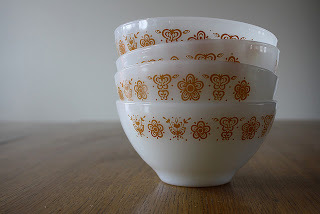 It started out innocently enough, I was looking for a set of vintage Corelle dishes. I have never owned a complete set of dinner dishes. When I had first moved out of my parents house as a teenager, I had gotten a couple of Fiestaware plates and bowls and eventually I would just add different plates and bowls from here and there, for a complete mismatched set. Over the years, and countless moves later, who knows where they've ended up. When we went to replace the mismatched stuff in the house, we ended up just getting some cheap all glass plates and dishes from Target. But I have always longed for a set of Corelle Butterfly Gold dishes. After scouring eBay and etsy I found a 10 person set, complete with serving platers and other pieces like a butter dish and gravy boat. After finding that, I was addicted. I had to find more things to complete our kitchen ware. I found some Corningware casserole dishes and skillets and some melemaine stuff too. Online shopping can get me in trouble because with a click of a button it's yours, then before you know you it you've spent too much money on stuff that in all reality, you probably don't "need". And so, I struggle with guilt, for spending money on things I "want" instead of "need". Even though I know I find good deals on eBay and all that. I'm sure there are more responsible things I could spend money on. Here's a picture of the pattern I am in love with. It's called Butterfly Gold. But... I do have a plan. I'm going to go through all our old mismatched stuff and also (for those of you who know me)my mountain of clothes to purge them yet again, but this time I'm really going to let go of a lot of stuff. For some reason in the past I would always hang on to some article of clothing thinking "I'll fit in this again one day." Or "One day I will find something to wear this too." Well not this time... I'm really going to purge as much as possible. I'm planning on taking them to Buffalo Exchange, Crossroads or Freestyle and selling them off. It probably won't be a lot of money, but it will make me feel better for my online splurge. When the weather gets better I'm thinking we can do a garage sale, since I wasn't able to get to my friends garage sale to sell stuff I needed to. We will see how that goes. The kids are playing drums in the bedroom. What a wonderful thing, sounds like a perfect opportunity for me to clean the kitchen. So I'm off to get that started. How much you gonna pay me lady?